A study by the Centers for Disease Control shows that 60 percent of children and 18 percent of adults aren’t getting enough fruit each day, and worse: 93 percent of children and 83 percent of adults are deficient in veggies. According to new research, the USDA recommendation of four to six servings of produce each day is too conservative to achieve protective health benefits; in fact, researches have shown that you need to eat more than seven servings of fruits and veggies daily to reduce your risk of death by at least 23 percent. Key to getting the biggest benefit from a diet rich in produce is eating the rainbow. Meals featuring bright and varied colors indicate a wide variety of nutrients. Produce like cruciferous vegetables (broccoli), berries, and nitric oxide-rich vegetables like beets are great options. But saying to add colorful produce to your diet is one thing. Doing it, making it fun and delicious, and getting your kids to eat it? That’s another challenge. 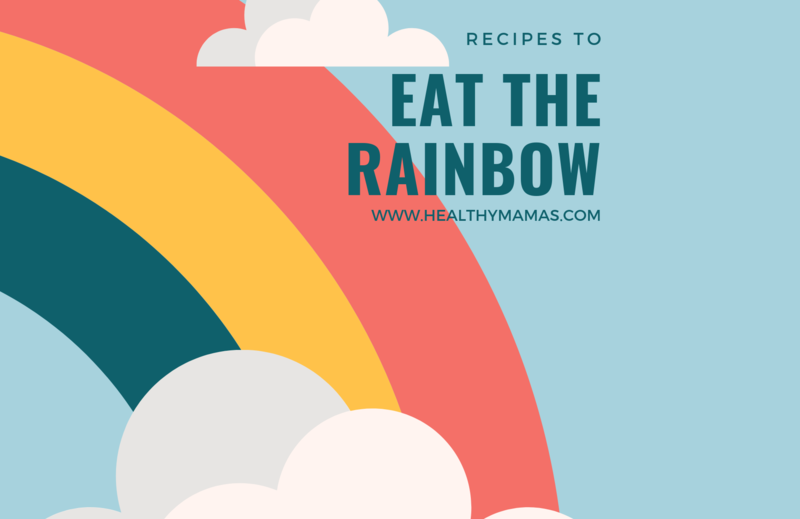 We’ve put together a collection of fun recipes that encourage you to eat the rainbow. They’re easy to put together, appealing to kids, delicious and nutritious. A delightful pink color and drinkable food? A perfect way to pack in antioxidant-packed berries and spinach. Everyone loves pizza and this one is beautiful. Take a little extra time to create a pizza packed with veggies; your kids will be mesmerized by the colors. But, keep in mind that most pizza crusts are nutrient-poor and full of refined flours. You can boost the nutrition of your homemade pizza by making my grain-free flatbread crust or using a frozen crust by caulipower! Not a quick and easy one, this is more of a kitchen project. But boy, does it wow in the end! Of course, please skip the blue food coloring unless you use these. No recipe needed here! This is a fast and easy way to pack in a variety of produce at a single sitting. Kids love to eat anything on a stick and skewering fruits and veggies makes for a beautiful presentation and easy cleaning. Add dressing to make the raw veggies even tastier. Spiralized veggies are a huge hit–they’re colorful and fun. But they’re not just stand-ins for pasta. Check out this recipe that allows you to spiralize your own veggies or grab them prepped at the store. Topped with crunchy nuts and seeds, this is a winner. This delicious recipe is a perfect dinner and packs in lots of gorgeous color with basil, zucchini, bell peppers, carrots and more. Can you say easy cleanup? One pan dinners are the best for keeping it simple on weeknights and this one is flavorful and features a wide variety of veggies that roast at the same time as the fish. Perfect for make-ahead meal prep and lunchboxes, this salad packs in protein with the quinoa while featuring crunch from red cabbage, carrots, broccoli and more. You could go off-recipe here and add in whatever salad veggies you have in the fridge. Great after-school snacks or party appetizers, these rainbow pinwheels are packed with veggies and hummus and can be put together in just a few minutes. For a dairy-free option, swap out the cheese spread for red pepper or plain hummus! Great for meal prep, make a set of these ahead for the week. This recipe has it all: fruits, veggies and an easy but delicious homemade dressing. There’s no better way to get kids to eat veggies than letting them dip chips into it! Make this colorful salsa for a snack, to top tacos or for your next party. Pair cassava chips or organic, non-GMO corn chips with it to round it out.